Kilauea is the youngest and most active Hawaiian shield volcano, located on the southern part of the Island of Hawai'i, known as Big Island. Hawai'i is the southernmost and largest of the island chain, which owes its existence to the very active Hawaiian hot spot. Kilauea volcano is near-constantly erupting from vents either on its summit (caldera) or on the rift zones. At present, Kilauea volcano is still having one of the most long-lived eruptions known on earth, which started in 1983 on the eastern rift zone and has mainly been concentrated at the Pu'u 'O'o vent. Dominantemente efusivo desde 1790, pero ~ 60% ~ explosivo durante los últimos 2500 años. Kilauea volcano (Hawai'i) activity update: Eruptive hiatus continues, gas emissions at lowest levels since before 1983. Crusted cone and channel of Fissure 8, primary vent of recent eruption. Steaming caused by rainfall. Credit: USGS. Activity at Kilauea remains at very low levels, with no eruptions anywhere on the volcano, as has been the case since early September. Seismicity and deformation are at background levels, and interestingly, the Hawaiian Volcano Observatory reports that total gas emissions across the volcano are at their lowest levels since before the start of the long-term Pu'u O'o eruption in 1983. It remains uncertain whether the eruption has completely ended or just temporarily paused. The Aviation Color Code and Alert Level remain at ORANGE/WATCH. As the eruption of lava from Fissure 8 continues with little changes, but rather an increase as observed last evening, lateral outbreaks from the lower parts of the lava channel have been feeding a broad flow front that is now advancing southwest and threatens to inundate the Pohoiki boat ramp in Isaac Hale Park. During the past weeks, the lower east rift zone eruption has been continuing without really significant changes: around the main vent (fissure #8), a large cinder has been built by the continuous fountaining during the first weeks), and magma erupted from there has been flowing through a now well-established perched wide channel towards the new ocean entry at Kaphoho, where new land is being formed. Overflows from this channel and resulting secondary lava flows so far have been minor, and mostly confined to the existing lava flow field and not damaging any new homes. Occasional minor lava emission had also been observed from other fissures up to about 2 weeks ago last time. The summit caldera continues to undergo subsidence, characterized by a remarkably stable pattern of gradual build-up of seismic activity released in a magnitude 5+ quake at roughly 12 hours intervals, and resulting additional collapse of the crater floor and adjacent areas. Kilauea’s LERZ eruption continues in much the same way as it has since lava flows from fissure 8 reached the ocean at Kapoho at the start of June. The cinder cone constructed through lava spattering around fissure 8 is by now 55 m (180 ft) tall at its highest point, mostly hiding the lava fountains which only occasionally rise above it. HVO/USGS estimates that the rate at which lava effuses from fissure 8 is approximately 100 cubic meters per second. The well established 8-mile channel through which this lava is quickly transported to the ocean shows intermittent, short-lived overflows which rarely extend beyond the existing flow field. However, over the past few days some changes occurred in the final part of the lava channel, after the flow takes a southward turn towards the ocean entry. Bruce Omori observed during one of his morning overflights that lava has been somewhat ponding below Kapoho crater, resulting in overflows that migrate laterally away from the channel and once again threaten homes in the Kapoho farm and beach lots area north of the present flow field. The 27 June 2018 thermal map of the flow field confirms this and in addition shows that the lava channel has crusted over about 0.8 km (0.5 mi) inland of the ocean entry. Lava is now moving beneath this crust and into the still-molten interior of earlier flows before it enters the sea at former Kapoho Bay. Meanwhile the lava flow front at the coast broadened southward and is now nearly 3,2 kilometers (2 miles) in width. Lava is entering the ocean both on the southern portion of the flow front where previously the open channel ended but also along a 1 km (0.6 mi) wide area to the north where multiple laze plumes are produced from smaller oozing lobes. HVO/USGS reports that the new lava delta is by now 1,86 square kilometres (460 acres) in size, an increase of 50 new acres over the last two days. Apart from fissure 8, there is also near continuous activity from fissure 22 which shows weak spattering and creates smalls flows around the base of its spatter cone. Minor incandescence has also been observed at fissures 16 and 18. The fissure eruption at Kilauea’s Lower East Rift Zone continued without any change throughout the past week. Activity remains focused on Fissure 8 where lava is still erupting at a high rate and then flows within the well established channel to the ocean. Fissures 6, 16/18 and 22 have been intermittently active, showing incandescence and/or lava spattering that at times created small flows. The fountains at Fissure 8 have built a horseshoe-shaped tephra cone of about 50 m (165 ft) height through repeated hurling of lava fragments onto and over the growing rim. Lava exiting the cone forms rapids or cascades near the base of the cone as well as a series of standing waves in the uppermost section of the channel. Lava flow velocity varies in different portions of the channel, being faster in bends and more narrow channels. It is also faster in the center of the channel and decreases in speed toward the margins where friction with the channel walls increases. HVO/USGS estimates the maximum lava flow velocity in the channel to be 7.7 m/s (17 mph). Large blocks of cooled lava the size of a car or bus are sometimes dislodged from the channel margins and carried downstream in the lava flow. As the 13 km (8 mile) perched open channel is filled to the brim with lava there are periodically small overflows occurring along the channel margins. Such overflows are however sluggish, moving slowly downslope as they build up the levees, and being short-lived they don’t extend beyond the current flow field. The only area where there is some minor expansion of the current lava field is along the southern margin of the wide ocean entry at Kapoho. Multiple white steam and laze plumes indicate that there are many smaller streams of lava that enter the ocean across a broad area. Some as liquid, fast flowing pahoehoe lava and others oozing from a textured a’a flow field. By now this eruption has added about 1,54 square kilometres (380 acres) of new land to into the sea. The wide lava ocean entry creates off shore upwelling and large underwater explosions. Kilauea’s summit continues to steadily subside in response to the large volume of magma that was drained from beneath the caldera towards the lower East Rift Zone early May. This process is most pronounced around Halema’uma’u crater whose walls are falling in on itself and by now has grown to nearly twice its original width and depth – having partially swallowed the old overlook parking lot. What was once a 12-acre (0,05 square km) lava lake in the middle of the crater has grown to more than 130 acres (0.526 square km), at places up to 300 m (1000 ft) deep, and is getting larger every single day. A preliminary estimate of summit volume loss is around 260 million cubic meters as of June 15th, 2018. This slow but steady slumping of Halema’uma’u has given rise to a remarkable seismic pattern that has been established since the end of May and persists to this day. Over a time span of ca 20- 28 hour periods, lower seismicity (about 10 earthquakes an hour) quickly changes to more intense seismic activity (up to 35 earthquakes an hour) as pressure builds up deep inside the vent. Eventually this pressure built-up culminates in a gas driven explosion and seismic event larger than magnitude 5, creating a gas and ash plume that rises about 305 meter (1000 feet) before it quickly dissipates. These stronger events may thereby trigger partial collapses of the unstable rim of Halema’uma’u crater. With around 500 earthquakes of magnitude 2 – 3 and higher on a daily basis, Kilauea’s summit is more or less constantly shaking and this seismicity is readily felt by the residents in nearby Volcano village. Meanwhile the dramatic changes that occur around Halema’uma’u are also affecting the nearby buildings of the Jaggar museum and HVO head quarters. Besides being covered with layers of ash and some smaller projectiles, these structures have suffered considerable earthquake damage. Although they initially remained at the Hawaii Volcano Observatory after closure of Hawaii Volcanoes NP on May 4, 2018, the HVO scientists and staff eventually needed to evacuate the building and relocate to the University of Hilo by the end of May. Cracks have appeared in the walls and the flooring has buckled in response to the ongoing summit earthquakes and subsidence. Since closure of the park about 6 weeks ago, the Jaggar museum is all but deserted and the popular observation deck is now covered in ash, riddled with cracks and in general structurally unsound. Park staff have started to evacuate important exhibits and art work from the museum to store them elsewhere. It is not clear when the Jaggar Museum, founded in 1912, will re-open again to the public – if at all. Kilauea’s summit caldera continues to subside in response to the withdrawal of magma from beneath the volcano’s summit that drains to the Lower East Rift Zone eruption site. The seismic cycle with M5 events and explosions in Halema’uama’u crater also persists, resulting in inward slumping of the crater rim and walls. Throughout the weekend, Kilauea’s lower East Rift Zone eruption persisted to vigorously effusive large amounts of lava from fissure 8 which travelled along the well established 13 km (8 mile) channel to the broad ocean entry at Kapoho. Fissure 8 continues to produce lava fountains with a pulsating height varying from 30 to 60 m (100 – 200 ft). This ongoing spattering of lava has built up an impressive cinder cone that partially encircles the fissure 8 vent and is now 51 m (170 ft) at its highest point. Lower fountains are thereby hidden from view within this cinder cone, but taller fountains are still adding fragments of lava (spatter) that continue to build the cone higher. From the fissure 8 vent, lava flows freely over small cascades (rapids) into a well-established perched channel that travels for about 13 km (8 mi) to the ocean entry at Kapoho. Near the vent, lava is traveling about 24 km per hour (15 mi per hour) but it slows down to about 2 km per hour (1.5 mi per hour) near the ocean entry at Kapoho. Occasionally, minor amounts of lava briefly spill over the channel levees but overall the flow field seems stable with little change to its size and shape for the past few days. There has only been a small amount of expansion of lava onto new areas at the southern boundary of the flow near the coast and south of Vacationland. As of 15 June, the total lava flow area of this eruption is 23,9 square km (9,2 square miles) and the new lava delta constructed in the ocean covers 1,3 square km (320 acres). Apart from the vigorous lava fountaining at fissure 8, there is still lava oozing from fissures 16 and 18 which create small lava flows, some mild spattering intermittenly observed from fissures 6 and 15 and increased steaming from fissure 9. During day 42 of Kilauea’s lower East Rift Zone eruption, lava unabatedly poured out of the vent at fissure 8 and rapidly flowed through the well-established ca 13 km (8 Miles) long channel into the wide ocean entry at Kapoho. Throughout Thursday 14 June, 2018, volcanic activity became more vigorous again at Fissure 8 where lava fountains sustained a height of 61 meter (200 foot) and the spatter cone grew to about 49 m (160 ft) at its highest point. A morning overflight confirmed that activity at the lava flow channel continued with no significant changes and only rare, small overflows of the mainly the northern channel levees. The lava ocean entry at Kapoho remains fairly broad and has one main entry along with several minor ones. Laze plumes at the ocean entries were often blown onshore and areas of offshore upwelling were present. Since the flow path of lava from fissure 8 into the ocean is well established, there is little to no expansion of lava on land as most of it covers the ocean floor offshore. In the eastern part of the fissure eruption system fissures 16 and 18 continued to ooze lava but without creating any significant lava flows. Over the past 2 days, Kilauea's eruptive activity in the lower East Rift Zone persisted with little change. Fissure 8 continues to vigorously effuse lava fountains of varying heights, sometimes 10 meter (35 feet) above the growing cone of cinder and spatter which is now about 45 m (140 ft) at its highest point. This fountaining continues to feed huge amounts of lava through the massive perched lava channel that runs for about 8 miles (13 kilometer) before reaching the ocean at Kapoho. According to HVO/USGS calculations, there is at least 100 cubic meters of lava transported through this fast moving channel every second! This is the equivalen to 26,000 U.S. gallons flowing by per second or 3 tanker trucks racing by per second... The 12 June 2018 thermal image shows that after ca. 2,5 miles the wide lava flow channel changes into a braided flow for ca 2,5 miles before turning east ward into a single, narrower channel. At Four Corners, the ‘a‘a flow appears to be channelising as well, transporting lava more efficiently through the area before pushing it into the mile wide flow at Kapoho. On Tuesday evening 12 June, HVO/USGS reported the presence of two prominent ocean entries creating vigorous steam plumes, but during the Wednesday morning 13 June overflight there were observations of a only one towering steam plume from a single focused ocean entry point. Offshore from where lava enters the ocean, areas of upwelling continue to be sighted but are now more dispersed than first sighted. Day by day, Kilauea’s summit caldera continues to subside and Halema‘uma‘u crater keeps crumbling with every explosive event. Over the past week, such explosions occurred once per day and have been registered as magnitude 5+ earthquakes. They are however not typical earthquakes at all since there is no major fault-rupturing event. Instead, pressure builds up beneath the rubble pile that is choking the conduit and is released as an explosion – a continuous seismic cycle. HVO/USGS released new images of the dramatic changes that have occurred Halema‘uma‘u crater in the past couple weeks. The crater’s steep walls continue to slump inward and downward in response to the ongoing summit subsidence. The former Halema‘uma‘u crater floor has subsided at least 100 m (about 300 ft) and the deepest part of Halema‘uma‘u is now about 300 m (1,000 ft) below the crater rim. Circumferential to the crater rim there are both newly formed and growing ground cracks which are by now cutting across the parking lot of the former Halema‘uma‘u visitor overlook, which was closed in 2008 when a lava lake re-appeared in the crater. Kilauea’s eruption in the lower East Rift Zone continues without showing any signs of weakening. The current activity has been sustained for 38 days now, 2 days longer than the last fissure eruption that occurred in this area in 1960. However, compared to the rapid change of activity locations and advancing lava flow fronts, the eruption seems to have geographically settled for the past week. Fissure 8 remains the centre of activity with a line of closely spaced vents that continue to erupt lava. The height of the produced lava fountains thereby fluctuates between 35 – 55 meter (115 - 180 feet), just above or below the rim of the large spatter cone (pu’u) that they build up along the downwind side of the vents. Lava fountaining from fissure 8 continues to feed a fast-moving channelized lava flow trending north and then east to the ocean entry at Kapoho Bay. Hawai’i Volcano Observatory scientists estimate the lava output to reach up to approximately 100 cubic meters per second! The width of the active part of this long lava channel varies along its length, ranging from about 90 to 275 meter (100 to 300 yards) wide, splitting from 1 channel into a braided lava river that comes back together before turning eastward to Kapoho. Despite the fact that this channel is full of lava, only minor overflows of the channel levees occurred along the length of the lava flow which so far were short-lived and hence did not pose an immediate threat to areas not previously covered by lava. Comparison of previous lava flow maps and thermal maps with the current ones show that the wide lava channel flowing over what used to be Kapoho concentrates into a narrow funnel from where there is now only 1 main ocean entry. The lava that has filled Kapoho Bay in the past week built a new lava delta which is now about 1 square kilometre (250 acres) in size. The interaction of molten lava flowing into cool seawater causes pulsating "littoral explosions" that throw spatter (fragments of molten lava) and pieces of solidified glassy lava high into the air. HVO/USGS warns that these ocean entry littoral explosions can create hazardous conditions both on land and at sea, because the lava fragments can be thrown far inland, as well as seaward. Volcanic gas emissions from the fissure eruption remain very high, a recent measure indicated them to be nearly twice the value of the past two weeks. The only other activity in the Lower East Rift Zone fissure system was glow, degassing and weak spattering noted for the last several days at Fissures 16 & 18. This activity is however not creating any lava flows. Meanwhile at Kilauea’s summit the caldera continues to subside, resulting in inward slumping of the rim and walls of Halema`uma`u crater along with a ca. 24h returning pattern of increasing seismicity that builts up towards a small explosion with abve M5.0 earthquake after which there is a short break before seismicity picks up again. Sulfur dioxide emissions from the volcano's summit have dropped to levels that are about half those measured prior to the onset of the current episode of eruptive activity. On the 30 days anniversary of Kilauea's currently still ongoing eruption in the lower East Rift Zone the USGS published the below infographic which puts the activity from 4 May to 4 June 2018 into numbers. The previous eruption in this part of Kilauea's East Rift Zone dates back to 1960 and lasted 36 days, the same time span that the current eruption has reached as of today - not showing any signs of decreasing activity yet. The eruption in the lower East Rift Zone remained concentrated on fissure 8, where continuous vigorous lava fountaining fluctuates, at times reaching heights of 70 meters (230 feet). This activity continues to feed the lava channel flowing northeast before turning westward toward Kapoho where it transforms in a very broad lava flow that by now almost entirely covered Kapoho and Vacationland and filled up Kapoho Bay. Sideways moving of this broad Kapoho Bay lava flow creeps north through what remains of Kapoho Beach Lots, but none of the other previously active lobes of the large fissure 8 flows are receiving fresh lava and have hence stalled. Also no other fissures apart from fissure 8 were actively erupting lava in the past few days. The only activity observed was some incandescence from fissure 24 and heavy fuming from fissures 24, 9 and 10 – all located just west of fissure 8. About 600 homes have been destroyed by the multiple lava flows that were produced during this lower East Rift Zone eruption, in the Leilani Estates during the early days of the eruption and lately in Kapoho and Vacationaland. The large lava delta that has been created outside former Kapoho Bay is about 1.9 (1.2 mi) wide, creating multiple vigorously steaming lava ocean entries as well as upwelling of a large offshore area where lava is actively flowing onto the ocean floor. HVO/USGS warn that the lava delta is unstable because it is built on unconsolidated lava fragments and sand, loose material that can easily be eroded away by surf, causing the new land to become unsupported and slide into the sea. Additionally, the interaction of lava with the ocean creates "laze", a corrosive seawater plume laden with hydrochloric acid and fine volcanic particles that can irritate the skin, eyes, and lungs. Since the start of the eruption about 35 days ago, the volume of lava erupted so far in Puna is about 0.11 cubic kilometres in total. Phil Ong compares this to the 35 years long eruption that had been going on at Pu’u O’o prior to the start of this eruption, and notices that although the eruption rate is about 25 times higher, is not nearly a match to the ca. 4.5 cubic kilometres that were erupted from Pu’u O’o since 1983. Much like the fate of the lava lake in Haleam’uma’u at Kilauea’s summit, the lava lake in Pu’u O’o has disappeared since all magma was drained to the eruption site in the lower East Rift Zone from early May. The crater floor of Pu’u O’o collapsed and the crater now has a funnel shape geometry with a deep cylindrical shaft, filled with rubble, that is about 350 meters (1150 feet) deep. The many earthquakes that are occurring on Kilauea volcano also affect the Pu’u O’o vent. HVO/USGS reports that tollowing a magnitude-3.2 earthquake at the summit, twelve rockfalls were recorded in Puʻu ʻŌʻō between 10:31 and 10:56 AM on Friday 8 June, with a prominent, but brief, red dust plume ejected into the air around 10:50 AM. Subsidence of Kilauea’s summit keeps going on as magma continues to be drained from the summit area towards the active fissure eruption site in the lower East Rift Zone. As much as 9900 earthquakes have been registered on Kilauea over the past 30 days, most of which occurred at the volcano’s summit. These events have led to dramatic changes in and around Halema’uma’a crater which for the past 10 years contained an active lava lake. Since the start of the lower East Rift Zone eruption, this lava lake has been systematically drained – leaving behind a large empty vent with unstable walls that partially collapse, creating explosions with large ash plumes. Continuous deflation of the whole summit area and its accompanying earthquakes in turn also destabilise the walls of the Halema’uma’u vent and surrounding crater, resulting in widening of the vent and partial collapse of the crater as its west side is slumping inwards due to the formation of large cracks on the Kilauea caldera floor. Over the past week a cycle emerged in the seismicity monitored at Kilauea’s summit area, where increasingly larger and more frequent earthquakes culminated in a magnitude 5 earthquake. These earthquakes are usually accompanied by an explosion and ash cloud from Halema’uma’u crater and followed by a short period of less earthquakes before seismicity picks up again, building towards the next larger earthquake and explosion. The last two of these larger earthquakes were a M5.6 earthquake on Wednesday afternoon 6 June at 16h07 and a M5.2 earthquake on early Friday morning 8 June at 02h44. In each case there was also a small explosion at Halema’uma’u crater creating an ash plume that rose up to about 3050 meters (10,000 feet). Each time summit seismicity dropped significantly right after the earthquake and explosion, but then picked up again a few hours later and gradually increased until the next larger event. The activity in the lower east rift zone continues with no significant changes. After a brief episode of declining output of magma from fissure #8 and the contemporary reactivation and lava effusion from a number of other fissures, activity shifted back to fissure #8 which has been the main vent of the rift eruption over the past week. No other fissures were active as of 6 June afternoon local time. The slow caldera collapse (subsidence and slumping) currently observed at the central Halema'uma'u crater and in its immediate surroundings continues. Seismic activity has again been increasing after Tuesday morning's small explosion, and lead up to a new explosion that occurred a few hours ago and is visible on the deformation plot (s. attached). 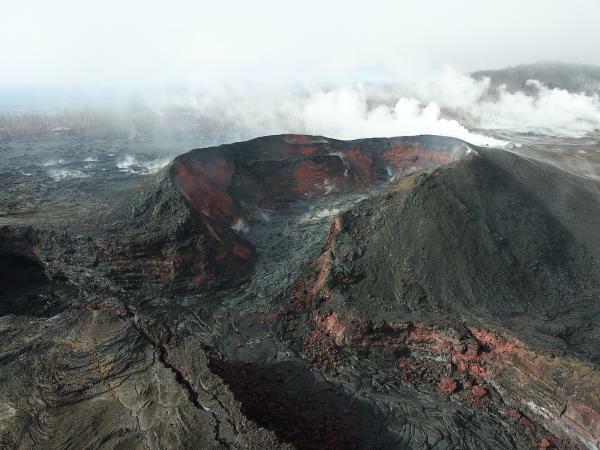 Over the past week eruptive activity in the fissure system concentrated on fissure 8 and the massive lava flow channel that was created from it, traveling fast north eastwards along highway 132 before turning eastward and inundating the Kapoho Bay area. Local volunteers daily head out by boat to the cut off area around Poihiki on rescue missions for any animals and persons that got stranded there after the fissure 8 lava flow covered the intersection between highway 132 and 137. Meanwhile northernmost lobe of the Fissure 8 flow, in the Noni Farms Road area, is still barely advancing to the northeast and minor breakouts along the channelized fissure 8 flow have been very small and stagnated before travelling any significant distance. The intensity of lava fountaining from fissure 8 fluctuated over the past 7 days, at times increasing the lava fountains’ height from about 45 m (150 feet) to 75m (250 feet) before it falls back to about 40- 55 m (130 – 180 feet) high. Downwind from the fountains a new cinder cone (pu’u) has formed of about 35 m (120 feet) high and high amounts of Pele’s hair and reticulate (foamy lava) have been carried and spread across the larger downwind area. 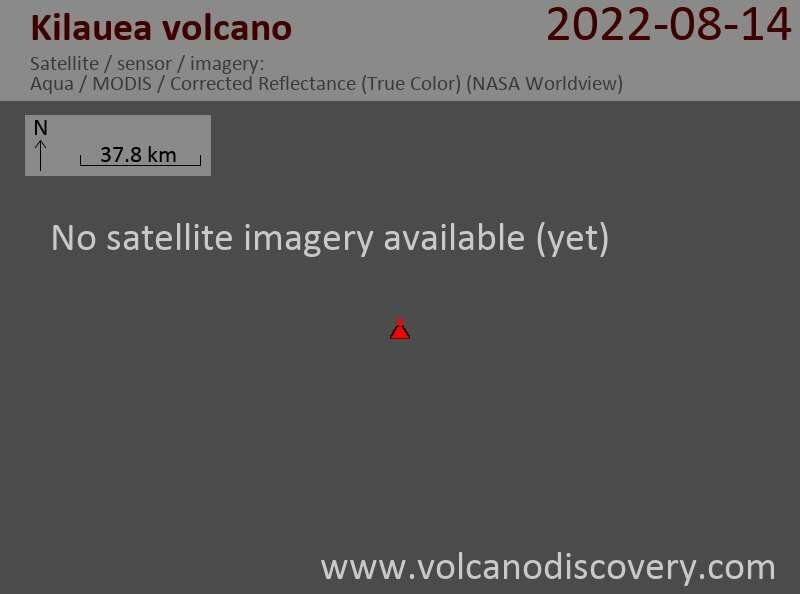 There is no way of knowing for how much longer this eruption will go on, but it seems that the fissure 8 vent is now well established within the plumbing system of the currently active fissure eruption sire. Fluctuation in the height of the resulting lava fountains is thereby normal as it reflects pulsation in the magma input and pressure build-up below. Although impressive, the currently witnessed max 400 feet high lava fountains of this eruption are still small compared to the up to 1800 feet tall fountains that were produced in the Mauna Ulu eruption (1969 – 1974) or the present record of around 1900 feet lava fountaining from the vent in Kiluaea Iki in 1959. It is of course also possible that other fissures are re-activated or new ones will open up. Recent eye witness reports state intense degassing and perhaps even minor amounts of lava being erupted from fissures 9 and/or 24 at the western part of the active fissure system. If large lava flows would form from these fissures they are likely to destroy large areas of the remaining Leilani estates subdivision. Meanwhile at Kilauea’s summit caldera inward slumping of the rim and walls of Halema`uma`u crater continues in response to ongoing subsidence of the entire summit area. HVO reports that seismicity remained at high levels for most of Monday night (4 june) and into Tuesday morning (5 June) when a small explosion occurred at 4.32 AM HST. This explosion had an equivalent earthquake magnitude of M5.5 and generated an a small plume that rose about 1000 feet (305 meter) above the summit. Summit earthquake activity dropped right after this explosion but has since been slowly on the rise once again, following the same pattern of summit seismicity in the previous weeks. Locally felt earthquakes are expected to continue, and further ash explosions are likely. Sulfur dioxide emissions from the volcano's summit have decreased, over the last week, but emission rates remain high enough to impact air quality in downwind regions. Additional bursts of gas released with intermittent explosive activity are also transported downwind and may temporarily affect air quality as well (HVO/USGS). The eruption continues without significant changes: lava fountaining remains strong from fissure #8 although a bit decreased during the past day, feeding a large river of lava that flows towards the new ocean entry at Kaphoho. Seismic activity at the summit has been low. HVO reported this morning (evening in Hawaii): "Fountaining at Fissure 8 continues to feed a robust channel transporting lava to the northeast along Highway 132 and east to the ocean entry in Kapoho Bay. Multiple observations from field crews and overflights suggest the Fissure 8 fountain is less vigorous this evening, with maximum heights of 130-160 feet. As of early evening, lava was filling Kapoho Bay, extending out approximately 750 yards from shore. A laze plume is blowing inland from the ocean entry but is dissipating quickly. The lava breakout on the north side of the Kapoho cinder pits continues to be stalled southeast of the intersection of Railroad Avenue and Cinder Road. A lava breakout from the south margin of the flow near the intersection of Highway 132 and Railroad Avenue has completely encircled the Green Lake cone." Earthquake activity at the summit was low after Sunday's small explosion, but has slowly increased since that time. Levels are approaching those of Sunday early afternoon, before the most recent small explosion. Inward slumping of the rim and walls of Halema`uma`u continues in response to persistent subsidence. We expect that earthquake rates will increase in the coming hours and culminate in another small explosion, perhaps within the next day, following the pattern of the past few weeks. " In the Lower East Rift Zone vigorous fountaining persisted from fissure 8 throughout the weekend, feeding large amounts of lava into the channel that runs northeast as the western branches of this flow became inactive during the night from Friday 1 to Saturday 2 June. The remaining fissure 8 lava flow continued to travel along Highway 132 to Kapoho and eventually crossed Highway 137 at the ‘Four Corners’ intersection of Highways 132 and 137 on Saturday morning 2 June at 9h30 am local time. It thereby effectively cut off the land south of this active flow front from Pohoiko to Vacationland Hawaii where any people that got stuck are evacuated by boat and helicopter. The same lava flow subsequently wrapped around Kapoho cinder cone and entered it through the gap on its east side, filling up the crater and creating a large steam plume as it evaporated all the water of Green Lake. As lava continues to pour into the Kapoho cinder cone in Green forest, it creates a stunning ‘lava fall’ The active flow then spread out to a 0.5 mile wide lava flow front that continues to make its way towards the ocean at Kapoho Bay. On Sunday evening 3 June 19h00 local time HVO/USGS reported that this flow front was merely 225 meter (245 yards) away from the ocean. The lava fountaining from fissure 8 in the western part of the eruptive system was the main activity over the past few days. Whereas fissures 18 and 22 were still feeding lava flows traveling south by the end of last week, both were inactive by the early morning of Saturday 2 June when the only other active flow noted during an overflight was from fissure 16, in the eastern part of the active rift system, which was weakly active. By Sunday 3 June local time none of the fissures besides fissure 8 were active as by then fissure(s) 16 (and 18) only showed incandescence without fountaining. At the same time heavy steaming and abundant gas emission was noted from fissure(s) 9 (and 10), potentially announcing re-activation of these vents which prompted mandatory evacuation for the Leilani Estates area around these fissures. Meanwhile at Kilauea’s summit caldera the vent inside Halema’uma’u crater keeps collapsing as magma was drained from beneath it and the summit area is deflating. A small explosion occurred on Friday afternoon 13h39 but ash emissions have overall decreased, possibly reflecting the accumulation of rubble at the base of the growing summit crater. Earthquake activity was low during the night from Friday 1 June to Saturday 2 June but then seismicity picked up again and there were many earthquakes overnight from Saturday 2 to Sundqay 3 June, leading the HVO/USGS to expect a another small explosion to take place in the next day. Whereas ash emissions from Halema’uma’u crater are currently low, the emission of volcanic gasses remains high. The eruption continues at Kilauea Volcano’s Lower East Rift Zone where active vents along the length of the fissure system are feeding multiple lava flows. Fissure 8 at the western part remains the most active, vigorously spewing out lava fountains up to 80 meters (260 feet) into the air and having formed a downwindsmall spatter cone of ca. 30 meter (100 feet) height. The lava flow that resulted from fissure 8’s activity travelled northeast across the Puna Geothermal Venture and currently has multiple active lobes branching out which threaten Kapoho and the intersection between highways 132 and 137. The speed of these lava flows has been up to 100 yards an hour, but they advance in bursts: at times the front does not move as new incoming lava is building up the flow until it becomes unstable and the lava suddenly surges forward at speeds as fast as 600 yards an hour. Residential areas between the active lobe fronts of the fissure 8 lava flow and Kapoho have been evacuated during the night from 30 to 31 May local time. If these lava flows reach the intersection of highways 132 and 137 a large area along the coast and highway 137 will be cut off and become completely inaccessible. In the eastern part of the active lower rift, fissure 18 also continues to erupt lava which feeds a lava flow that is slowly traveling eastward and might eventually create a new ocean entry. The ocean entries that were previously created by lava flows from fissure 22 are currently inactive, but a new flow fed from the central part of the fissure system is slowly making its way just west of the previous flow channels and might reach the ocean near Mackenzie State park. Meanwhile the National Park Service and Department of Transportation have started to clear out the 2016 – 2017 lava flows that covered the Chain of Craters Road along the coast. If the cracks on Highway 130 would become larger or lava flows would cut off this road, the Chain of Craters Road would be the evacuation road for around 1000 people living in Kalapana southwest of the currently active fissure system. The new emergency road should be ready for use within 2 weeks time. Other hazards of lava effusion at the fissure besides destructive lava flows are high levels of sulphur dioxide near the vents (up to 12.4 ppm) and Pele's hair and other lightweight volcanic glass that forms from high fountaining of Fissure 8 and falls out downwind. The activity in Lower Puna remains stable at high levels with the principal vents being fissure #8 (western portion of the system) and #18 (eastern part). Both feed voluminous lava flows that continue to consume land, property and pose threats as to cut-off additional areas, prompting the need for evacuations especially in the Kapoho area. Fissure #8 inside Leilani maintains its strong lava fountaining, with jets of liquid lava reaching 60-80 m (200-250 feet) and feeds the large lava flows directed to the NE with current flow fronts on and north of Hwy 132 in the area of of Noni Farms road. Although the flow front advance has currently slowed to less than 50 yards per hour, it can pick up quickly and the threat of it reaching the Four Corners area and cutting off Kapoho remains significant. Evacuations of Kapoho are underway. On the western end, a new lava flow from fissure #18 is now headed to probably generate a new ocean entry soon in the Ahalanui Beach Park area, which would cut off Pohoiki and a large triangle of land. HVO writes: "by late afternoon, the front of the Fissure 18 flow was about 0.5 miles from Highway 137 and was spreading and slowing. In the late afternoon, a new flow lobe began branching from the south side of the fissure 18 flow approximately 1.5 miles upslope from the flow front. During the day, sporadic bursts of activity were also observed from Fissures 22, 6, and 13. Low level spattering and intermittent fountaining from Fissure 21 were also observed in the late afternoon and early evening." Additional immediate hazards related to the activity are the large amounts of gas, with dangerous SO2 concentrations in areas near the fissures, and fall-out from the fountain, which also generates a plume of very light-weight tephra (reticulite pumice and Pele's hair) that drifts and falls several hundred from the emission point in the downwind direction (currently west). Ash continued to erupt intermittently from the vent within Halemaʻumaʻu crater at Kīlauea's summit. Additional explosive events that could produce minor amounts of ash fall downwind are possible at any time. Earthquake activity is elevated at the summit, with a few felt events reported throughout the day. Volcanic gas emissions at the summit remain high. High effusion rates continue to characterize the ongoing eruption, which has largely focused on the fissure #8 vent in the western portion of the fissure system, near the intersection of Luana St and Leilani Blv. Sustained lava fountains reaching up to 50-70 m from a main vent and several smaller ones next to it have been feeding large, channeled lava flows that have been advancing quickly to the NE, broadly along Hwy 132, at speeds exceeding 200 m per hour at times, causing more property burnt and mandatory evacuations around Noni Farms and Hale Kamahina Roads. from HVO: "The Fissure 18 flow also remained active, moving downslope toward Highway 137 at rates of less than 100 yards per hour. Overnight, sporadic bursts of activity were also observed from Fissures 7 and 15. Pele's hair and and other lightweight volcanic glass from high fountaining of Fissure 8 are falling to the west of the fissure and accumulating on the ground within Leilani Estates. Winds my waft lighter particles to greater distances. Residents are urged to minimize exposure to these volcanic particles, which can cause skin and eye irritation similar to volcanic ash." As magma continues to withdraw from the summit reservoir, the pit crater inside Halema'uma'u continues to collapse and has been enlarging significantly over the past days. As its floor several hundred meeters down covers with hot debris, blocking degassing and potentially coming into contact with infiltrating water, explosive eruptions occur from time to time, and as the vent deepens and grows, could potentially become larger. In the lower East Rift Zone (LERZ) fissure system, the area of Leilani Estates and Lanipuna Gardens was the scene vigorous eruption of lava also throughout Monday 28 May. Early Monday morning it became clear that the fast-moving flow which broke out the evening before originated from fissure 8 which fed a channelized flow that first moved north along an older flow before turning east and quickly destroying a new residential area. Its initial advance rate of hundreds of meters (yards) per hour had however slowed down to a few meters (yards) an hour by Monday morning and eventually stalled during a short period of inactivity. Late in the afternoon of Monday 28 May, however, vigorous fountaining resumed at fissure 8, producing a fast-moving lava flow that travelled first north and then northeast at a speed of ca 18 meter (20 yards) an hour. Fissure 8’s vigorous fountaining has produced significant amounts of Pele’s hair which are transported downwind, with reports of some strands falling in Pahoa. Ash continued to erupt intermittently from the vent within Halemaʻumaʻu crater, at Kīlauea's summit throughout Monday 28 May. HVO/USGS reports that a brief emission event at about 4:35 AM local time sent ash to about 3050 meter (10,000 feet) above sea level, and a similar event around 6:30 AM sent ash to approximately 3660 meter (12,000 feet) above sea level. Observations from the ground, by UAS, and by satellite during the past week have documented retreat of the summit vent walls due to collapse of the steep conduit and rim.